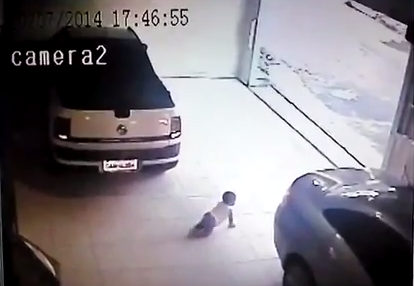 A 1-year-old baby was almost ran over by a car in the garage of his family's home in Brazil last Sunday. A CCTV footage shows the infant crawling towards the back of the vehicle without being noticed. The car, which is making its way out of the garage gate, then reverses over the child. Luckily, two neighbors who were passing by heard the baby crying and immediately told the driver to stop. One of them then took the baby out. The little boy only sustained minor injuries, a slight burn on his ear and shoulder due to the warm car engine. Inside the car were the boy's mother, sibling and stepfather who was driving. They were to go to a doctor for a check-up. OMG! Thank God at nasave ang baby.